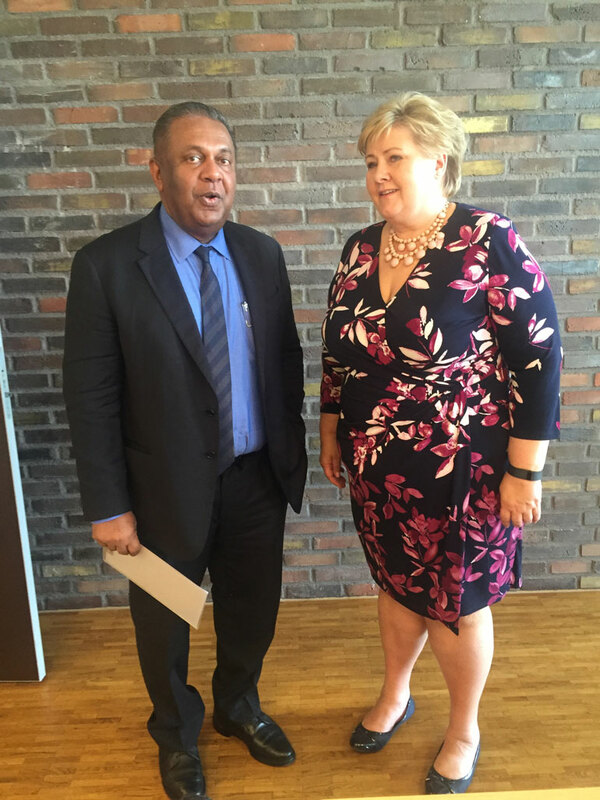 Sri Lankan Foreign Affairs Minister Mangala Minister Samaraweera, who was on an official visit to Norway from 21-23 June, called on Prime Minister Erna Solberg on 21st June. Prime Minister Solberg expressing her views during the meeting with Minister Samaraweera acknowledged the valuable contribution to Norway by the Sri Lankan community in the country and commended the Sri Lankan government’s efforts made to actively engage the Sri Lankan diaspora including in Norway, in development efforts. The Minister also had meetings with Foreign Minister Børge Brende, Minister of Fisheries Per Sandberg, State Secretary Tore Hattrem and the Standing Committee on Foreign Affairs and Defense in the Parliament of Norway. 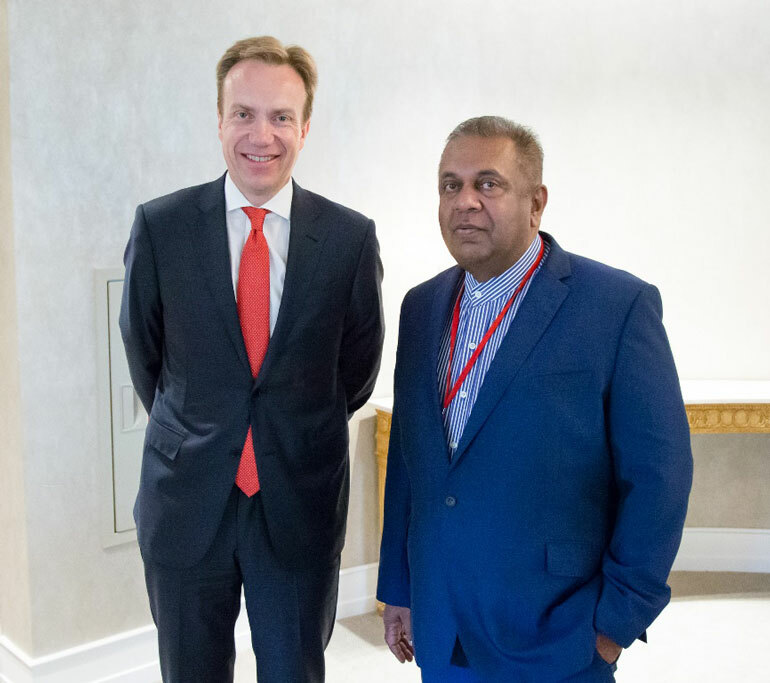 Discussions focused on follow-up to the visits of Foreign Minister Børge Brende and State Secretary Tore Hattrem to Sri Lanka this year, and ways and means of enhancing bilateral cooperation and collaboration including in focused areas such as the fisheries sector. At the meeting with the Standing Committee on Foreign Affairs and Defense, chaired by Anniken Huitfeldt of the Labor Party, responding to questions raised, Minister Samaraweera briefed the Members of the Committee on the progress and achievements of the Government as well as plans on Constitutional reform, reconciliation and development. Emphasizing the need for greater interaction and engagement between the legislatures of the two countries, the Minister invited the Members of the Standing Committee to visit Sri Lanka at a mutually convenient time. The Minister also spoke at the Norwegian Institute of International Affairs (NUPI) on ‘Advancing Reconciliation Diplomacy: Sri Lankan Perspective’. 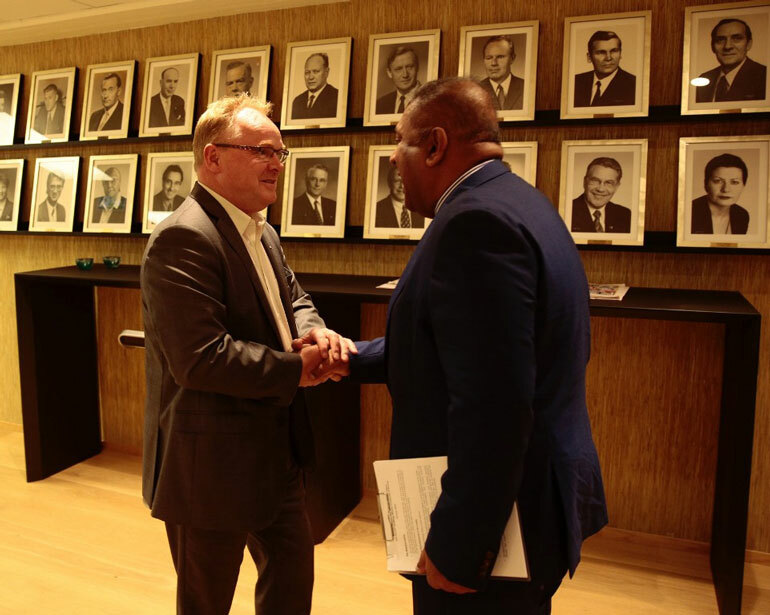 Foreign Minister Mangala Samaraweera also delivered the Opening Plenary Address at the 6th World Congress Against the Death Penalty in Oslo on 22 June, on the theme ‘Progress and Setbacks in Asia: Lessons to be learnt’. The World Congress Against the Death Penalty which takes place every 3 years, is organised by the association Ensemble contre la peine de mort (ECPM). The Minister of Justice, Wijedasa Rajapakse, also represented Sri Lanka at this meeting. Formal diplomatic relations between the two countries span 65 years. In 1977 Norway opened a NORAD office in Colombo recognising Sri Lanka as an important development co-operation partner. Norway’s development assistance to Sri Lanka to-date totals over $ 700 million.